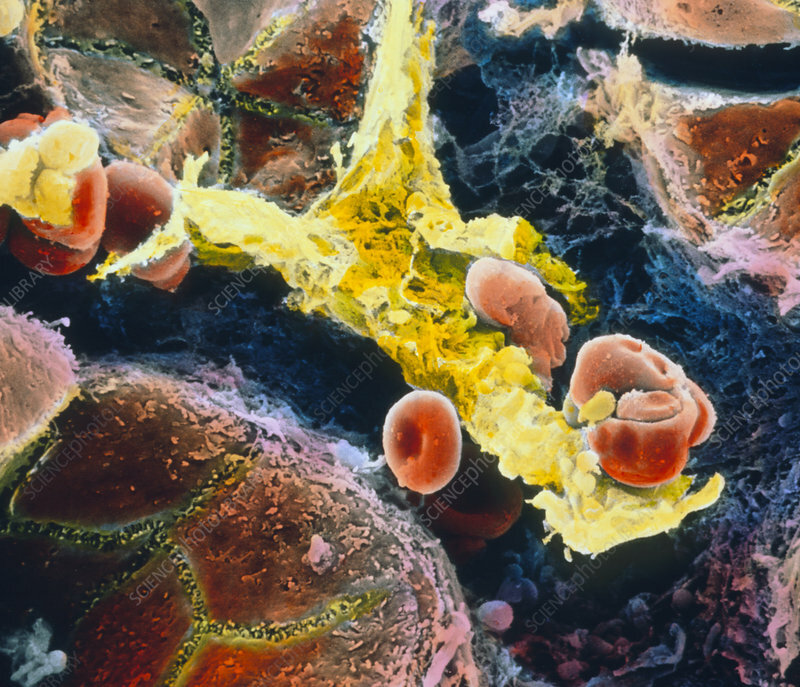 Removal of red blood cells in the liver: false-colour scanning electron micrograph (SEM) showing the phagocytosis of red blood cells (red discs) by a Kupffer cell, a type of tissue-fixed macrophage in the sinusoids of the liver. The lining of the porous capillaries or sinusoids of the liver is composed of 2 cell types: endothelial cells (bronze) and Kupffer cells (yellow), which are highly irregular in shape. The Kupffer cells serve to purge blood of old, redundant red blood cells by engulfing and breaking them down in a process called phagocytosis. Magnification: x1970 at 6x7cm size.